The Col de L’Iseran is a 46.6km long climb from Bourg St Maurice and is the highest paved pass in the alps. This ride offers views of the Glacier du Pissaillas and follows the Isere river most of the way. Passing through the popular ski resorts of Sainte Foy, La Thuille and Val d’isere the climb is varied and interesting along with being a climb on most cyclists hit lists! The Category HC climb with a maximum grade of 9.5%, an average of 4.2%, and an ascent of 2045 metres is long and tough! The summit sits at 2770 metres and provides views of the Grande Sassiere summit. 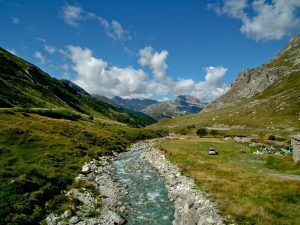 The Tour de France has climbed Col de L’Iseran 7 times in the past and is due to cross again in 2019. This Col features in The Big One and The Route des Grandes Alpes tours or can be included as part of a bespoke tour just get in touch to discuss your next cycling trip with us!